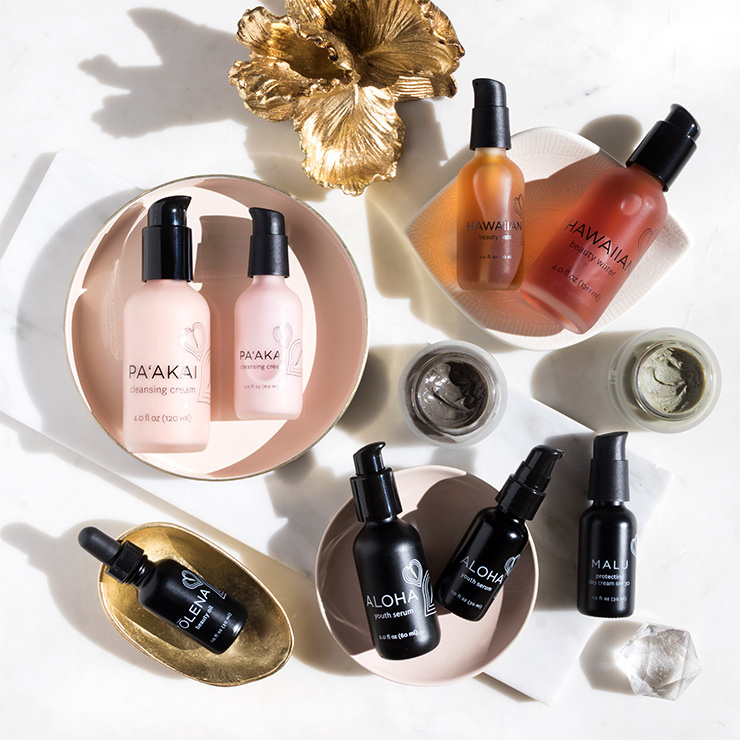 May we introduce Malu Protecting Day Cream + SPF 30 by Honua Hawaiian Skincare, a tropical addition to your skincare line up. Malu is the Hawaiian word for shade, shelter, protection, and peace. This beauty delivers a feeling of protection from UV rays and environmental pollutants while moisturizing the skin. Hawaiian laukahi makes skin look toned, while lending a gentle, soothing feel. Noni fruit creates a clear, youthful appearance. Jasmine promotes a look of even skin tone and red seaweed instills skin with a sensation of detoxification. This reef safe sunscreen goes on with no white look and has a lovely scent. Apply as the final step to your daily skincare routine to moisturize and lend a feeling of protection. Wears well alone or under makeup. Active Ingredients Zinc Oxide = 18.90%. Other Ingredients: Caprylic/Capric Triglyceride (Glycerin And Coconut Oil Derived Fatty Esters), Aqua (Water) , Glycerin (Coconut-Derived)*, Sorbitan Stearate (A Fatty Acid Derived From The Plant Based Sorbitol/Stearic Acid Combo), Cetearyl Glucoside (Glucose And Coconut Derived Emulsifier), Stearic Acid (Coconut-Derived), Isostearic Acid (Soybean Derived), Polyglyceryl-3 Polyricinoleate (Glycerol And Castor Oil Fatty Acids) , Lecithin (Sunflower-Derived)*, Cetyl Alcohol (Coconut-Derived Fatty Alcohol) , Carthamus Tinctorius (Safflower) Seed Oil*, +Plantago Major Leaf Extract (Hawaiian Laukahi), Morinda Citrifolia Fruit Extract (Noni Fruit)*, Aloe Vera Barbadensis Leaf Juice (Aloe)*, Prunus Amygdalus Dulcis (Sweet Almond) Oil*, Jasminum Officinale (Jasmine) Oil*, Jasminum Officinale (Jasmine) Flower Extract*, Carrageenan (Red Seaweed), Stearyl Alcohol (Fatty Alcohol Shea Butter-Derived) ,Tocopherol (Vitamin E)*, Xanthan Gum, Polyhydroxystearic Acid (Plant Sourced Fatty Acid, Used To Stabilize The SPF), Caprylhydroxamic Acid (Natural Preservative*, Amino Acid Derived From Coconut Oil), Glyceryl Caprylate (Coconut Oil-Derived). I received this product in the Beauty Heroes monthly box and then purchased another one on my own. This sunscreen has a beautiful texture, blends in easily with no white cast and has a light pleasant smell. My pump started having some problems towards the end of the bottle, but overall I am extremely happy with this product. I have been very impressed with Honua the brand and hope to purchase more of their products soon! The Best Sunscreen on the Market. The more research I've gotten into on sunscreen, the harder and harder it's been to find one that won't give me cancer, or put heavy toxic metals in my body. Until Beauty Heros sent me this in their subscription box, I've been using it since, and I can't imagine changing. It's very moisturizing and goes on sheer. It layers BEAUTIFULLY under makeup (which is very important to me, as a professional MUA). The only thing is that after a little bit of use I haven't been able to use the pump, so now I twist it off and apply the sunscreen from the pump straw directly to me face. But I don't even care because this stuff is that good, and I'm not sharing it with anyone else. You don't need very much either, it's lasted me MONTHS. Thank you Beauty Heros for introducing me to this beautiful product. This cream is very good, lightweight, moisturising, no white cast and good smell; anyway the pump of the bottle stopped working after a while ad I had still half the bottle to use. So I had to open it an try to take it out each morning.. and some product remained unused since I was unable to take it out. So, I’d totally repurchase it if it came in a different package. Honua is a grat brand! Title sums up opinion. Good natural suncream. Product too thick for a pump bottle, I now have about 1/4 of the product left but I can't get it out of the bottle. I loved using this sunscreen but had to pass it off to someone else as it repeatedly caused a slight allergic reaction for me. That aside, it smelled gorgeous and worked quite well!